*thoughtful sigh* It's hard to believe that it has only been two weeks since my last Notes from the Porch update. In many ways it seems like it has been a decade and other ways it seems like it has been only a few short hours. I can't even begin to express my humble and grateful heart for your kind prayers, thoughtful messages & cards, sweet facebook messages, texts, & phone calls (which I am still working on returning). To my incredible precious parents, sweet Ba, & amazing sister... thank you so much for letting me "be me" and work through all of the implications that the latest diagnosis has brought me. You have shown incredible kindness, compassion, and love as you navigated my changing emotions and loved me incredibly well. Jen, Michelle, Monica, & Katie- thank you so much for letting me cry again and again on your shoulders. You have lived the love of Christ- with absolutely no gain to yourselves, and I stand amazed at how you love me and never make me feel like a burden but cry along with me. Thank you. And to so many of you who have been praying and sending me encouraging notes I could never explain how grateful I am. The reality is that this latest diagnosis does come with a ton of ramifications. It means that I can't proceed with an intense battle with Lyme Disease until this latest illness is dealt with. (I will be still fighting Lyme throughout this but it won't be the "sole focus".) This means that my "nice little plan" for healing in the next year is more likely going to look like at least two more years. TWO. MORE. YEARS. It also means a ton of changes that are going to need to occur (many that I will be sharing in the next several months). It means that treatment is going to become more intense and after this is dealt with I will still need tons of energy for the Lyme fight. It means a delay in a lot of dreams that are known and many that lay in the secret places of my little heart. It means more doctors visits, more blood work, more tests, more treatment, more... all things sick world related. It means having to delay returning to teaching, a delay in completing my PhD, a delay in things that I love to do (ballroom dancing, etc.) and an acceptance of a lot of days with pain and nausea. It means navigating a very tricky road of not only Lyme and Cancer, but of this environmental illness also. It means accepting that my poor gastrointerologist felt overwhelmed with the fact that he was not an expert with Cancer or Lyme Disease but has tried his hardest to find ways to help my poor digestive system and my pain and looks absolutely stunned at the latest news and is absolutely silent when I ask what we should do next. It means accepting that he, and many of my other doctors (non specialists), have no idea how to proceed. It means accepting that stress upsets the foundation of my fragile body and that due to all of the tears that I cried I have been in incredible pain for the last week and feel horrible. It means accepting that the temporary handicap tag that I just picked up three weeks ago will now be turning into a permanent one since I don't have the energy to walk long distances. It means filling out social security disability paperwork through tears, going through the application process in denial, and crying and begging the Lord for the application to be accepted to help with financial needs. I have mentioned before that I was asked last year by a girl (that I used to be close friends with) if "I really believed that I would be healed". At the time it was incredibly hurtful and painful as the question seemed to imply that it was my lack of faith that was keeping me from being healed. In later conversations she continued to ask similar questions and I have heard this same type of questioning occurs to lots of people who have long battles with illnesses. At the time I was incredibly hurt and had to work through truly forgiving this friend who abandoned me at a time when I really needed love and support. But throughout these last two weeks I have realized the absolute error in this type of questioning. These questions put the emphasis on what I am doing (or not doing). This question makes the assumption that it is me and not God's power that healing and answered prayers come from. This implies that those who are sick and not getting better have a "lack of faith". And while I will do everything in my power to be a good steward of this body that the Lord has given me it is not about me. It is about God and HIS perfect timing. My minutes, my days, my hours are in HIS hands. HE can decide how this little body can best serve Him. HE is the one who holds me in the palm of His Hands. 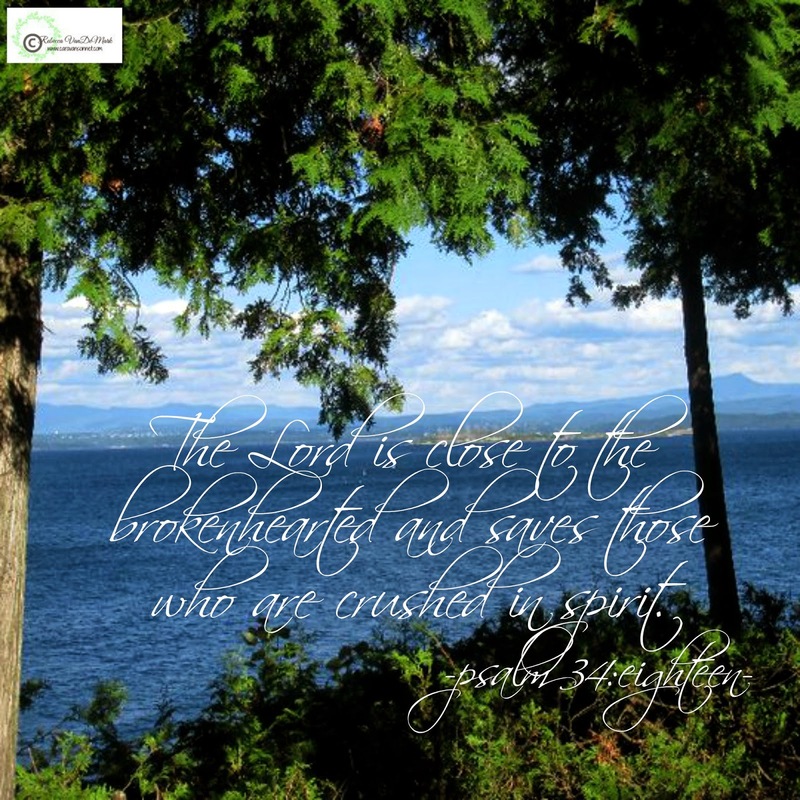 I am learning once again that the Lord truly does save those who are crushed in spirit. He takes our tears and tenderly loves us. Sometimes He does so "instantly" and other times it is slow & steady. Sometimes we don't see the "miraculous" event here on earth. Instead, like those who have gone before us (Hebrews 11) the rewards come much much later... where the miraculous events that the Lord has done here on earth (in His perfect timing) will intersect with the knowledge gained of the millions & millions of events rewarded in Heaven. Recently I was re-reading the story of Abraham and Isaac and came upon a verse that I have read countless times as a child. The verse from Genesis 22 talks about God being the "Jehovah-Jireh" - the provider. Over these past years and months I have testified to this and seen how well the Lord truly does provide for each of our daily needs but as I happened to be reading the Genesis chapter in a new version I was caught by the wording. This particular version said, "Jehovah-Jireh- the Lord will see to it". Obviously this is still the same meaning as "the provider", but this particular wording truly stood out to me. 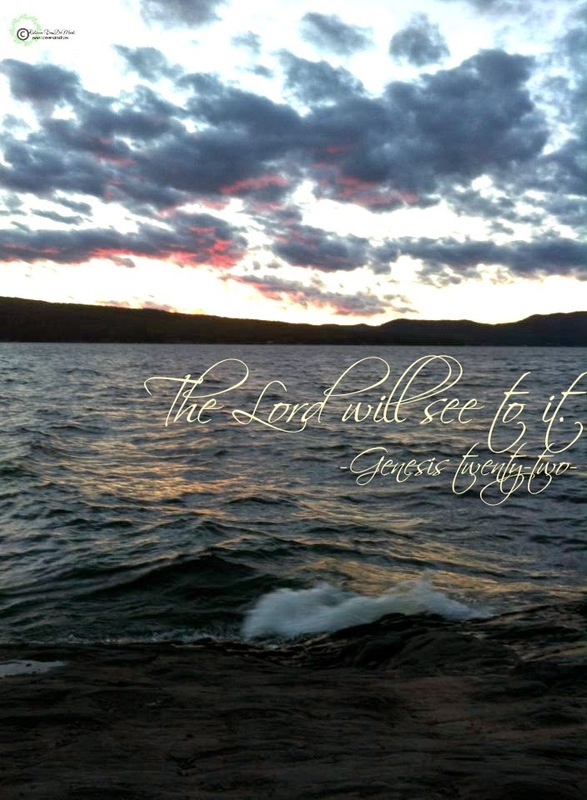 The Lord will see to it.... The Lord will see to all of the things that I have stated above are my concerns and will see to it. The Lord will see to it all. 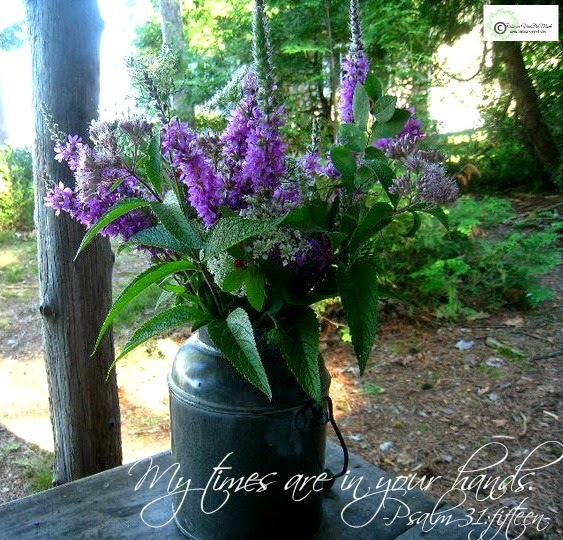 Thank you so much sweet friends for your continued prayers and support. I appreciate specific prayers for my stomach which is in incredible pain, for healing, and for wisdom and strength for each day. May you know the intimate truth of the Lord caring and providing for each need and concern that you have today. May you be comforted by His gentle love and in the midst of worry and concern may you know the truth that the Lord will see to it ...all of it.